Lately I’ve been attempting to be more of a literary focused site and therefore a lot of the movie news just hasn’t been covered here. Not to say I won’t cover movie news in the future, but there are a lot of good sources for that sort of thing anyway and the idea is that every so often I run a “007 Wire” report and give you all the latest Bond news that I didn’t cover. 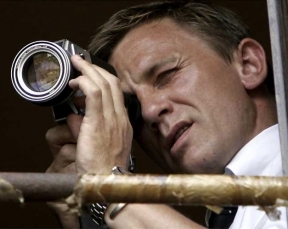 Anyway, a lot of Bond 22 rumors and reports came out in the past week or so. First up, filming began at the Palio di Siena horse race in Siena, (Tuscany) Italy. The crew was there for what appears to be mostly a documentary type of shoot as they weren’t really allowed to do anything else. The whole shoot however was quite controversial due to the nature of the race where jockeys are allowed to whip other horses or knock other riders off their horses so this got a ton of activists all riled up because by being in a Bond film they feel that it will glamorize the event. The Italian newspaper Il Giornale claims that the sequence that was shot will be part of the climax of the film and will involve the villain in a chase. Daniel Craig showed up at the event, but he didn’t take part in the filming. Lastly there are even newer reports that further Bond 22 locations will involve Italy. Another obituary for John Gardner. This time by The New York Times and replicated for the Chicago Tribune. Cinematical did a piece called “Seven Pieces of Advice for the Maker’s of Bond 22.” IMO: 1) Not necessarily. 2). Yes. 3). Maybe 4). Absolutely, though I wouldn’t be against a down to Earth Armorer like Dr. No or From Russia with Love. No to Moneypenny, though. 5) Not necessarily. I’m not a fan of The World Is Not Enough or Die Another Day, however, Purvis and Wade are great idea guys. It’s not bad to have them write the rough draft, but continue to follow them up with someone on a higher level. Haggis was and is a great choice. There are others too if you need fresher ideas. 6) I agree, but I think this whole news story was blown out of proportion, which is why I didn’t cover it. 7) Not necessarily. Keep him happy so that he’ll stay around, but he’s an actor not a writer. Brosnan got his hands dirty during parts of his tenure and it didn’t work for us if you ask me. Remember Lee Tamahori? He was terrible and his ideas are frightening to me. Good potential, I guess, but yeah, IIRC it was Brosnan who pushed for him. I was doing some reading and I came across this article at MSNBC. They start off showing a connection between Ian Fleming and this corporation called Jardine Matheson. They get this connection by back tracking to Robert Fleming’s (his grandfather’s) bank Robert Fleming & Co.. Anyway, not really a big deal, but there’s even a better connection here in that the idea clearly is associated to the literary world of Bond. In what way? Well doesn’t it kind of sound like the Thackeray’s from Zero Minus Ten? Specifically the heroin dealing, and the 1997 Hong Kong transfer of power? Perhaps it was inspiration for Raymond Benson. One of Roger Moore’s Walther PPKs from his Bond days was sold at an auction house in California for approximately £5771 – about $11,000 dollars. The same went for a suit worn by Sean Connery in Indiana Jones and the Last Crusade. Both were however beaten by Ewan McGregor’s lightsaber from Star Wars Episode 1: The Phantom Menace which fetched £24,527 – almost $50,000 dollars.